Experts always advise – Never take anything at face value. Many times, simple things like audio visual rental is not as trivial as it seems. Explore, question and check before going out for sound system rental or purchase. Taking a well-informed decision is the first rule of success and to take charge of the situation. We, at VRS Technologies, care for you and we would like to see you handle the event without any hiccups by helping you out in every possible way. Therefore, we have listed down for you the five common questions; an individual needs to ask before taking the sound system for rent. 1. Why are speaker stands important for sound system rental? Speaker stands might not be included in the package with the sound system rental, but they are very important for an event because, for one, they present a much classier picture and two, the sound is well distributed around the area and is more impactful than the speakers without the stand. Therefore, our advice is to go with the speaker stands. 2. How about setting the sound system up at the location? Well, this is where we come into the picture. Our technicians can walk you through the process as it is always better to keep the extra information up your sleeve. You never know when it might come in handy, but just to get you the clear picture our technicians not only deliver the sound system but also set it up for you. 3. Ask for a wireless microphone? Check if the sound system rental company provides a wireless microphone for the event, but, trust us, even if they don’t ask for one as the wireless microphone always comes in handy especially while making announcements on the dinner table where the wire would be too inconvenient. Also, don’t you agree the wireless microphones are cool? 4. Is it a UHF or a VHF wireless system? The UHF is not just professional, but also presents the sound with much clarity and without any interference, disturbances or that scratchy sound. Although the VHF is relatively inexpensive, we suggest not to go for the VHF unless you are on a tight budget. 5. Does the sound system produce a resounding effect? Whenever we think of a sound system, the first thing that comes to mind is the resounding effect. If the sound is dull, the event is likely to go flat. We highly recommend you to test the sound system on the company premises for the effect and then go for it. 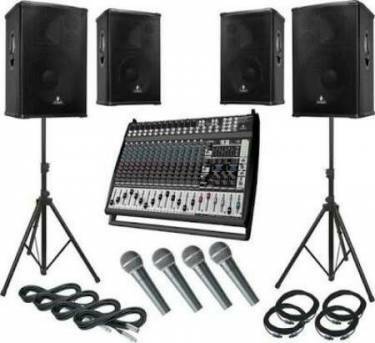 For more questions and sound system rental in Dubai, approach +971-52-7468085 or visit our website www.vrscomputers.com.